Group Exhibition, First Draft Gallery, Sydney, 2005. Exhibition catalogue essay by Christine Morrow. San Bao Zhi (Three paper packages) brings together a group of artists, Mandy Ridley, Pamela Mei-Leng See and Shan Terry, whose works incorporate the traditional craft of paper-cuts while initiating a broader investigation into the relationship between folk rituals, social practices, consumption and cultural identity. The exhibition title, appearing as it does in Chinese followed by an English translation, signals the show’s focus on cultural hybridity, in particular, artistic forms that may reflect the exchange of objects, people and ideas between China and Australia and more generally between East and West. To a significant extent, the artists’ intellectual concerns reflect their own cultural and personal experiences. Shan Terry was born and raised in mainland China. She migrated to Australia where she now lives and practices art but has also spent several years living elsewhere in South-East Asia. Pamela Mei-Leng See is an Australian artist whose parents are Malaysians of Chinese ethnic background. Recently she spent time travelling in mainland China. Mandy Ridley is an Australian artist who has spent many years researching culturally-distinct Chinese goods (including paper-cuts) available in Australia as imports; however a recent residency she undertook in India has seen her adapt and extend her concerns to reflect her encounter with Indian folk practices and to articulate her experience of being an Australian artist/traveller/tourist in a foreign culture. Each artwork in San Bao Zhi (Three paper packages) takes the form of multiple modules installed like ornaments, merchandise or packaging. Mandy Ridley’s work is a mass of multiple brightly-coloured shopping bags applied with geometric circular stencil-cut images in contrasting colours. Pamela Mei-Leng See presents a mass of one thousand lotuses cut and assembled from British World War II occupation currency notes. And Shan Terry presents a grouping of eighty hundred and eighty small paper fish cut from traditional Chinese red money envelopes. 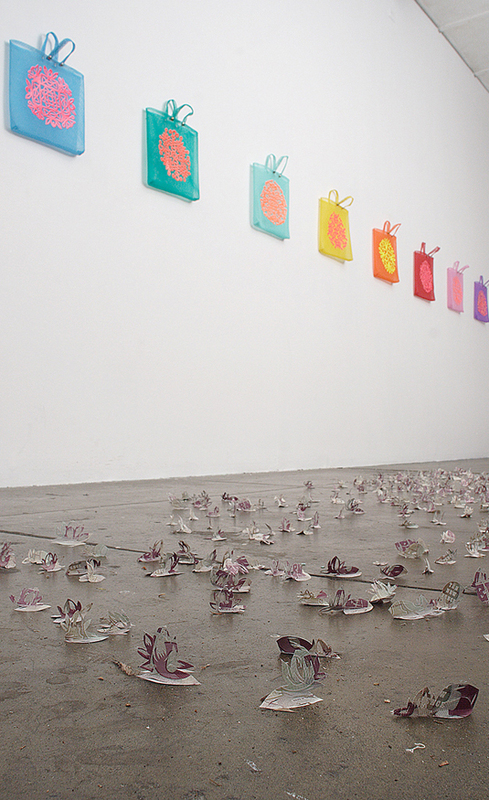 Although paper-cuts are interpreted and employed very differently by each of the artists, what their works have in common is a concern with how culture is disseminated through folk rituals, the assumptions and ideologies such rituals are founded on, and the way cultural practices can spread beyond a nation’s borders via travel and migration. It is not incidental that all three of these artists are women, for the exhibition acknowledges women’s traditional role in the dissemination of folkways, in particular those centred on hospitality, propitiating the gods or spirits, and beautifying the home. The medium of paper-cutting originated in China around 1500 years ago where it was established as an amateur practice by women and girls whose skills and designs were handed down from generation to generation. According to this technique, images are constructed by cutting either the negative or positive shapes of a natural or geometric motif into single or multiple sheets of paper. The resultant images had – and continue to have – many varied practical, ornamental, celebratory, symbolic and superstitious functions. Paper-cuts are made by hand and their motifs can be intricate and time consuming to achieve. The incorporation of detailed paper-cutting into the works in this exhibition signals the artists’ reflections on the theme of passing time. Moreover, the replication of multiple modules in each of the installations compounds the investment of time and allows us to see each artwork represents time itself unfolding in all its vastness. Two further meanings signified by the multiple forms within each installation include the idea of natural abundance as well as the concept of rampant consumerism – seen here in the form of an unchecked proliferation of money and goods. 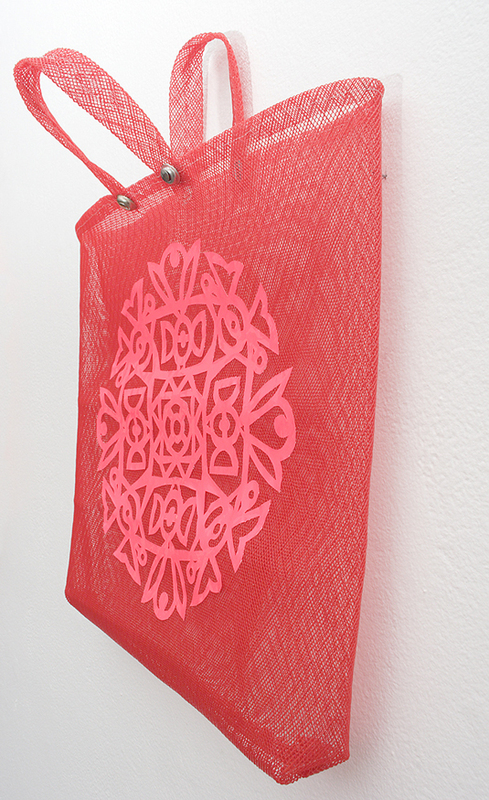 One of the works takes the form of shopping bags and the two others incorporate direct and indirect references to money. All three evoke the subjects of time and money, capitalism’s twin pillars, to examine how China’s (and to a lesser extent, India’s) ancient mercantile culture – which once existed side-by-side with its folk superstitions surrounding wealth and luck – has expanded exponentially and melded into a contemporary global economy in which ancient practices for propitiating the gods of abundance might be reinterpreted in the light of a new ideology. In each artist’s employment of the medium of paper-cutting, she addresses the origins of paper itself as a Chinese invention. But these art works also acknowledge paper’s multiple roles – it is a substance whose global currency is bound up in the exchange of images (art works, advertising, packaging) objects (Chinese cut-paper ornaments, paper money, and packaged consumer goods) and ideas (disseminated through the publication of books). But the ideas that are communicated on paper are not necessarily restricted to abstract thoughts published in rarefied texts. Ideas and ideologies are mobilised and enforced by the movements of money in the form of investment, aid, trade, colonisation and tourism. Paper packages most commonly refer to gifts or merchandise and can include parcels that travel some distance, crossing provincial or national borders via postage or import-export trade routes. San Bao Zhi (Three paper packages) focuses on the patterns of exchange and reciprocity that underpin both gift-giving and mercantile culture as well as the dissemination of objects – and the customs, ideas and story-telling that accompany them – from East to West and back again. There is nothing whimsical or anodyne in the forms or subject matter of paper-cuts and packaging. Paper cuts may of course refer to accidental injuries caused by pieces of paper whose razor-sharp edges slice into flesh. And packages may have the purpose of concealing something malignant: a suspicious white powder transmitted through the post or a parcel bomb that explodes with a political message. Sometimes, as the environmental protection movement makes us increasingly aware, it is the packaging itself, not what it conceals, that threatens our wellbeing. While these three installations of beautifully crafted and seductive works of art bear no threat of exploding in our faces, nor are they principally ornamental, despite appearances. They are equal parts celebration, admonition and warning. Gift and threat, source of pleasure and potential source of suffering, the layers within these three paper packages unfold with a multiplicity of political and social insights. Shopping bags with Rangoli designs by Mandy Ridley is a series of plastic mesh bags displayed like multiple items of merchandise. The bags are shown in permutations of vivid colours, each one featuring an ornamental motif in a contrasting shade. The high-key colours in the art work act as a metaphor for the unfamiliar, intense and emotionally heightened experiences that Ridley accumulated during an art residency in India: they signify the manner in which a place’s ‘local colour’ may sometimes overwhelm the outsider. The circular motif on each bag is the Rangoli design referred to in the title, part of an Indian folk tradition of daubing temporary patterns in coloured powder on the threshold of a house. Rangoli is the name given to both the practice of decorating threshold spaces in such a manner, and also the individual patterns and designs that are featured. These patterns are circular and symmetrical and they feature abstracted plant motifs. They are drawn each day by a woman of the household, and signify preparedness, cleanliness, beauty and luck as well as functioning to welcome visitors and guests. In Rangoli, Mandy Ridley has located an Indian motif that parallels some of the functions and symbolism of the Chinese paper-cut. Decorative and auspicious, both ornamental patterns typically grace the entrance to a dwelling, although paper cuts may also appear in windows and around smoke vents. Like paper-cuts, Rangoli is made from temporary materials that signify impermanence and renewal. But Ridley has recreated the Rangoli designs not in daubed powder pigment but in thin signwriter’s vinyl, cut out according to the form of the traditional Chinese paper-cut despite being reinterpreted in this high-tech plastic. In symbolically substituting the old, biodegradable, hand-made material with a new, permanent, industrial one, Ridley identifies the material changes (including the widespread introduction of synthetics and the increasing mechanisation of industry) of the rapid economic modernisation that India has experienced. But the substitution is an ironic one because plastic’s permanence is toxic. This art work reflects on both tradition and change in order to comment on the environmental disaster Ridley witnessed while travelling throughout the country, where streets seemed to be choked by the unchecked spread of waste mainly generated by plastic packaging. This art work was produced during, and in response to, Ridley’s travel and research in India. It arose not through a removed or disinterested surveying of the culture but from her experience of place and from the intimate exchanges with individuals that characterised her residency. The Rangoli motifs symbolise, above all, the cultural and social transactions that occurred when Ridley ­– a guest, tourist and outsider – crossed someone else’s threshold and was welcomed into their domain. Pamela Mei-Leng See’s installation, Money Back Guaranteed, comprises one thousand paper lotuses cut and assembled from actual British World War II occupation currency notes. The artwork partly represents See’s response to time spent in China, mainly Hong Kong, and her observations about the way that the effects of the burgeoning economy – in particular the influx of foreign money – is changing the place. By employing military occupation currency as the medium for these paper-cuts, See is able to liken the rapid expansion and increased globalisation of the Chinese economy to a form of neocolonisation. As this work speculates, the subjugation of a population can be achieved in all kinds of subtle ways – not only by military force but sometimes people may be bought off as well. The lotus flower in this installation is an obvious symbol of Chinese culture and identity but the motif plays on other meanings as well. As the lotus can grow in dirty ditches, it often symbolises the process of purification by which manner something grubby (in this case, money) may be laundered or filtered clean. But more particularly, the lotus is the motif of the Buddhist enlightenment and this work examines the tension between rampant commerce and a Buddhist teaching which advises that the pursuit of material things can only lead to suffering. This tension between god and mammon is partly expressed in See’s use of the number ‘one thousand’. For as well as being a sacred number and suggesting the concept of eternity or infinity, it is also a standard unit of economic measurement, for example it is often applied to the calculation of annual salaries. The form taken by Money Back Guaranteed may be seen as a rebus for the expression ‘let one thousand flowers bloom’, famously attributed to Chairman Mao. This rejoinder of Mao’s was uttered in1956, purportedly to encourage an intellectual flourishing and a multiplicity of ideas. In hindsight, the expression seems ironic and devious, coming from a dictator who suppressed all forms of dissent at that period and even more so in the Cultural Revolution of 1966-76. The ‘money back guarantee’ of the title expresses this paradox. For such a guarantee perversely assures the buyer that the commercial transaction it protects is dependable precisely due to the ease of the transaction’s reversal. The ease of its reversal is of course an indication that the purchase is thus impermanent or insubstantial. We might say that the solidity of the exchange is based on its fragility. Hence, the dependability of any such guarantee is ultimately an illusion. The Buddhist teaching that the material world is illusory finds its ultimate expression in See’s use of a currency that is obsolete. By using occupation currency, See highlights the highly symbolic, and hence insubstantial, nature of all commercial transactions. This artwork reminds us that all money is ‘play money’ as all paper money is buoyed up by a symbolic nominalism. Money Back Guaranteed thus reminds us that all money – and the exchange it facilitates – is ultimately fake. 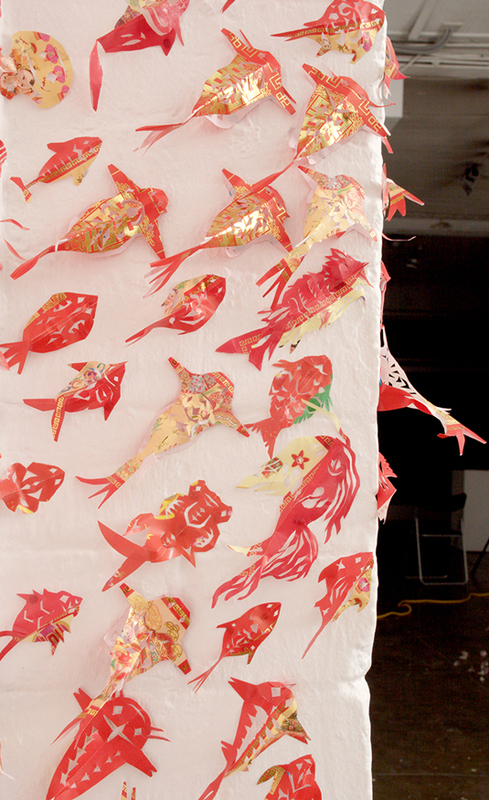 Shan Terry’s installation Ba Ba Red Fish brings together a number of motifs that relate to luck, auspiciousness, wealth and annual renewal. The red envelopes, images of fish and the word ‘ba’ in the title of the work are all associated with different superstitions and folk traditions in Chinese culture. Terry has created the fish by cutting into small red envelopes. Known as hóng bāo, these envelopes are typically associated with family traditions surrounding the lunar New Year when they are used for presenting gifts of money. The New Year is a festival that celebrates renewal, a fresh start, a flow of good luck, growth and abundance. The motif of the fish is also a symbol of luck and of wealth, as witnessed recently in Australia in the feng-shui inspired craze for locating fish tanks at the entrance to fashionable shops. Fish flourish by reproducing and travelling in groups that grow and multiply. When considered as a food source, fish signify an abundant supply that is capable of renewing itself and may never be exhausted. But Terry’s presentation of numerous fish also symbolises a diaspora: a spreading and multiplying population that may represent Chinese people whose cultural traditions and customs have disseminated throughout South-East Asia, Australia and elsewhere according to patterns of migration and trade routes. The ‘ba’ of the title may have two meanings. It signifies the number ‘eight’ an extremely lucky number for Chinese people because its pronunciation evokes the same sound as the word for ‘prosperity’. Its repetition in the title provides the meaning ’eight eight’ and this in turn resonates with the number of fish (eight hundred and eighty) that makes up this work of art. But the title Ba Ba Red Fish also sounds, to an English speaker, like a deliberate reworking of the children’s rhyme Ba Ba Black Sheep. This rhyme’s theme and purpose is to enumerate and symbolically distribute the proceeds of industry. Just as children’s nursery rhymes sometimes conceal more pointed political or moral messages within stories that on the surface appear absurdist, so does this apparently playful work by Shan Terry incorporate a deliberate social critique. As well as for presenting New Year gifts, the hóng bāo is used for payments and political bribes. In each circumstance, placing the money into the lucky red envelope is a way of covering up the transaction or putting a good face on it. Terry’s art work thus identifies that some of the rituals surrounding giving and receiving money involve dissimulation, usually in order to conceal various anxieties about wealth: its gain, its loss, or hypocrisies surrounding money’s exchange. By cutting open the hóng bāo, Shan Terry reveals its secrets, exposing some of the hidden mechanisms that govern its ritual use. Above from left: Ba Ba Red Fish (installation detail) by Shan Terry; Money Back Guaranteed (floor installation detail) by Pamela Mei-Leng See; Shopping bags with Rangoli designs (installation detail) by Mandy Ridley.